One would think that Germany, of all places, would have a logical and consistent system for identifying service machine guns. Any yet we see things like the WWI MG08/15 and the WWII MG15. What gives? When Germany first started to adopt machine guns (initially the Maxim), the designation used was “MG” and a two-digit number for the year of adoption. The applied to the short-lived early guns like the MG99 and MG01, and the best-known example is the German WWI mainstay, the MG08. The “MG” of course stands for maschinengewehr, or machine gun. When a standardized gun was modified to a new configuration, it was given a designation showing the original adoption date and the date of the new configuration. The most common example of this is the MG08/15 – an MG08 Maxim gun lightened for use as a mobile infantry gun. Another example would be the MG08/18, an MG08 modified to be air-cooled to reduce weight. Another designation that is seen is “LMG” – or “lMG” in place of “MG”. In English, we think of LMG as meaning “light machine gun” for mobile infantry use, but in German this indicated guns lightened for aircraft mounting. Typically, this meant perforating the water jacket of a heavy infantry gun, since the rushing cold air at altitude would fully adequate for the cooling needs of a fighter’s guns. As far as I can tell, the early aerial guns were designated “LMG” with a upper-case “L”, and this stood for Luft maschinengewehr, or aircraft machine gun. Before long, the “l” went to lower-case, and stood for leicht, or light. Same application, but a different designating word. The LMG08/15 is a good example of this, the Model 1908 gun, redesigned in 1915, and then lightened for aircraft use. Note that the MG08/15 and MG08/18 were both lightened guns intended for infantry use, and thus both retained the “MG” designation. While reasonably simple to use, this naming system became a problem in the aftermath of World War One. Germany was now strictly limited by the Versailles Treaty in what arms production it could undertake, but the nation’s leadership wanted to continue developing newer and better weaponry. The result (as it applied to machine guns) was a change in nomenclature to a system that did not reflect the year of development. Instead, gun designs would be given sequential numbers starting with the MG13. This was hoped to throw off the casual observer, who might assume (given the previous naming system) that the new guns had been developed during the war. The guns falling into this time period include the MG13, 14, 15, 16, and 17. The Flak 18 is another example from this period, named arbitrarily. Of course, this did overlap with some guns that actually were designed during WWI, like the Bergmann MG-15 and the Parabellum MG-14. Starting around 1930 when Germany became more open about its rearmament efforts, new machine guns reverted back to the original dating system use the year of adoption. The MG34 was the first mass-produced example from the re-adoption of this system, and the guns developed through the end of WW2 all used this system (MG31/41, MG39, MG42, MG45, etc). The major exception was for aircraft guns used by the Luftwaffe, which went to a wholly different system. Instead of using date-based numbers, they were given designations based on caliber. New guns would have their first one or two digits based on caliber, followed by a digit indication how many guns in that caliber had been adopted. So the first 8mm gun adopted by the Luftwaffe under this system was called the MG81. The first 13mm gun was the MG131, and the first 15mm one was the MG151. For these guns, a slash and secondary number was used to indicate a modification to change caliber. So the MG151 converted to 20mm became the MG151/20. A few additional suffixes that are encountered are z and v. These stand for zwilling (twin) and vierling (quadruple) and indicated multiple guns housed in a single mount. In the case of the MG81Z, the guns were set up as mirror images of each other, with one feeding from the left and one form the right. Hopefully this will help folks keep all these guns straight! Another stumbling-block for Anglophones is the designation MK. In the German (Luftwaffe) nomenclature system, it means MaschinenKanone– “machine cannon”, i.e. an automatic cannon. To those familiar with U.S. Navy and British nomenclature, of course, “MK” means “Mark”, as in “Sten MK III”, etc., and may be applied to any weapon or equipment, not just autocannon. Yet another ankle-sprainer is the factory code system adopted in 1940. In it, a weapon’s ID number was a three-digit group, with the first digit indicating who designed it (1= Rheinmetall, 2= Mauser, 3= Erma, etc. ), and the last two digits indicating where that design stood in that particular maker’s series of designs. Thus, the “MG-213” (a 13mm IIRC) wasn’t “Machine Gun M-213”, but was the 13th machine gun design from Mauser since the system was instituted. Similarly, the “MK-101” was the first autocannon design from Rheinmetall. And of course all the rules have exceptions. Like the MG-15/20, which started out as a 15mm HMG design but was “scaled up” to 20mm when it was concluded that its weight and bulk were only worth sticking into a Bf-109 if it could fire an explosive shell. It kept the MG designation in spite of the fact that every one actually delivered to the Luftwaffe was a 20mm. Things really got amusing when they scaled it up gain (unsuccessfully) to 30mm. Luftwaffe ordnance techs were at least spared the joy of having to remember of the extractors they needed from store were for the MG-15/20, or the MG-15/20/30. I suspect the latter would have been renamed the MG-15/30 in the interests of sanity. Each volume is two or more PDFs, so be prepared to allow some time for downloading. (About 2hrs is average for the whole set.) And oh yes, they’re public domain, and free. By MG-15/20 you probably mean MG 151/20? You may note that German model desinations were not hyphenated – they put a dot there of just left a space – thus Luger is a P.08 not P-08 and so on. The MG 151/20 was not an exception at all. One have to remember that in Luftwaffe and Kriegsmarine parlance 20 mm was still a machine gun, while in land forces (Heer) parlance it was already a cannon. Thus infantry’s Solothurn “2 cm FlaK 30” was navy’s “2 cm MG C/30”, while in Luftwaffe the Oerlikon FF (which never had a smaller caliber variant) was still the “2 cm MG FF”. MG 151/20 thus never needed to be a legacy machine gun to retain the moniker – for Luftwaffe it was still a machinegun at 20 mm caliber, and would have only advanced to MK should the 3 cm version be manufactured. BTW – where have you found the info on MG 151’s 30 mm conversion project? Neither Musgrave in German Machineguns nor Williams in Flying Guns do not mention that? And where have you found an MG 213 in 13 mm? MG-213A and B were classic gas-operated machineguns in 20 mm from the very beginning, and they had a variant called MG 213C which was a revolver cannon, a predecessor of the M39, ADEN or DEFA. It was the MG 213C which was redeveloped into a 30 mm gun, and thus justly renamed MK 213/30 – just like series-production MG 213C was just MG 213, after both “A” and “B” variantes were dropped. It seems that you might have mixed or amalgamated two different cannons into one. Yes, you’re right about the MG213. I just finished that part of Chinn’s book and confused the two. Sorry. The Luftwaffe’s HMG efforts were interesting, as they were at one point working on three different calibers; 12.7mm, 13mm, and 15mm. eventually, they settled on 13mm, but then turned around and replaced most of those with 20mm weapons, using the “13s” to replace 7.9 MGs in certain applications (the 7.9mm cowl guns on the Bf-109F being replaced by 13mms on the -109G, for instance). The U.S. spent a good deal of time and money trying to develop a “.60 caliber” MG based on the German 15mms. Said efforts lasting into the Korean War period. In the end, they gave up, and stayed with the .50 BMG caliber until it was superseded by the 20mm weapons in the late 1950s. Trivia note; According to Chinn, General Electric’s “Project Vulcan”, that resulted in the M61 20mm Vulcan Gatling-type weapons, began as part of the .60 caliber MG development project. So I guess it wasn’t a complete dead-end. As far as I know, the MG 151/15 saw a good deal of service in the Bf 109 F-2 variant, with about 1,000 made, although it is not clear how many of these were upgunned in the field or delivered from the factory with the MG 151/20. It was needless to say unpopular with the pilots who used the gun, although the MG 151/20 was decently well liked for its very flat trajectory and decent stopping power versus single-engined aircraft. The difference between “l” and “L” comes not from German cunning, but rather from simply grammar. In German all nouns are written with capital letter, while adjectives are written with lower case letter. Thus “Luft” or air, is a noun and so it merits a capital, while “leicht” or light is a lowly adjective. These seemingly minor differences were used in these otherwise identical designations to avoid misunderstanding – provided the recipient has at least rudimentary knowledge of German, that is. The “leicht” and “schwer” MG – light and medium machine guns in English – with their respective “lMG” or “sMG” abbreviations were introduced into German military parlance only during the interwar years. During WW1 any machinegun was MG – thus the MG08/15 was just MG, as was initially the Bergmann MG15 n/A. But then came the lofty sofistication of aerial combat, and aerial machineguns arrived to spoil the order in designations. This same Bergmann machine gun was then renamed an LMG 15 n/A – but it was NEVER an aircraft gun. What gives then? Simply the L was not just for Luft, but for Luftgekuehlte, or air-cooled machine gun. Thus the air-cooled MG 15 n/A became LMG, just like MG 08 or MG08/15 with perforated jacket, mounted in aircraft or true aerial MGs, like the Parabellum series of LMG13, LMG14 and LMG 14/17 German Vickers-like upturned Maxims. Of course, the Parabellum’s designers had the example of the Borchardt/Luger pistol action, which came after Maxim’s original “toggle” action. Leszek already implies it, but you have the l = leicht and L = Luft mixed up in your write-up. Very insightful. It gets even more entertaining when MG42 was re-introduced in form of MG3. How that came about? Why they just did not keep the old designation? Basically, the MG1 was a MG42 a newly built by Rheinmetall in .308″ (7,62x51mm). The MG3 is a modified and product enhanced MG1A3. Similarly, when the P.38 9mm pistol was re-adopted as the standard Bundeswehr sidearm, it was redesignated P1. No period, hyphen, or anything else. The HK91 series rifle in 7.62 NATO was the G3 because the first rifle issued to the Bundeswehr was the FN FAL (Canadian pattern, wood furniture, prong-type flash suppressor) known as the Gewehr 1. The Gewehr 2 was the Swiss SIG SG-510 aka Sturmgewehr 57, tested against the Spanish CETME, the forerunner of the HK91. The CETME won, and as the HK became the Gewehr 3. The G1 was an odd mix of Stg 58 and Canadian FAL. It got the metal forend and folding bipod of the Stg 58 and the wooden buttstock and pistol grip of the Canadian guns. I got one of the parts kits for Turkey when they were dirt cheap about 15 years ago and had it built up as a semi-auto. For a long period, BMW named its model with a three-digit code. The first number indicated the “series” or, for Americans, size. And the second two digits were the engine displacement. The “318” was a 3-Series with a 1.8-liter engine. The “540” was the bigger 5-Series with a 4.0-liter engine. Somewhere around ’00, that changed…some. Pardon me for not using specific examples, but the “330” could have a 3.3-liter engine. Or a 535 could have a 3.0-liter. How this system worked with captured machine gun? -captured Browning wz. 1928 were named lMG 28(p), despite both of these weapons are light machine guns. there number is not joint with previous user system. There is any system for captured machine gun or the designations are random? These were known collectively as “Fremd Gerat” (“foreign equipment”), according to John Walter in Guns of the Third Reich, and were designated under their own separate series. Which seems to be even more complex than the one for standard-issue German-made arms. The small letter in parentheses problem is solved. But what with numbers? Sometimes they are clearly legacy of former user system (ZB vz. 26 -> MG 26(t)) but sometimes no (after-mentioned FM 24/29 -> Leichte MG 116(f)) – it is random or not? My personal favorite of that is the MP 717(r) and MP 41(r) – both being captured PPSh-41s, but the MP 717(r) being issued simply as captured while the MP 41(r) being guns rechambered to 9x19mm and converted to take MP 40 magazines. The Fremdgerät system was sometimes ridiculous conscientious, and sometimes inversely. For example: French Gras 1874 rifle has own number: Gewehr 361(f) and Kammerladningsgevær m/1849/55 rifle has own number: Karabiner 504 (n). Note that both rifles fit rather gun collection than 1940s war, but the 12,7mm ShVAK was simply named: Flgzgf. Maschinengewehr (r) i.e. Aircraft machine gun (Russian), without number or at least caliber. Note that exist two ShVAK-s: one (earlier) 12.7mm and one 20mm. The Russians named 12.7mm version пулемёт (machine gun) or крупнокалиберный пулемёт (big-bore machine gun) and 20mm version пушка (cannon). Denny, I am not positive about this by any means but there may have been a political motivation to change the designation from MG42 to MG3. I believe the only difference between the two is that the rate of fire was lowered a bit and the caliber was changed to 7.62 NATO for the MG3. Exactly. The capitulation of german (=Nazi) forces was later called “Stunde Null”, zero hours. It was branded as thestatr of a totally different, democratic and new Germany… although it was rather a re-packaging and carrying on. Anyways: After the rearmament of (Western) Germany was decided and a german Army was founded, a lot of “obvious” breaks with the purssian and nazi heritage were decided: US-inspired uniforms, the first weapons were actualy loans from the US (see: http://de.wikipedia.org/wiki/Liste_der_Handwaffen_der_Bundeswehr), etc. When rearmament was in full swing, some “proven” designs where re-adopted: on request of the Bundeswehr, Rheinmetall produced new machine-guns to MG42-specs, most notable change beeing caliber .308″-barrels, adopted as MG1. Simultaneously, old WWII-MG42s from US and other arsenals where re-barreled to .308″ and introduced as MG2. Several improvements were added, as were production enhancements, leading to MG1A1, A2, A3, and finally – in 1969 – to MG3. Heavier bolts to reduce the ROF, better sights, AA sights, mounting points, etc. (don´t remember everything our armourer told me during my military service – more than a quarter century ago , so I had to refreshen my memory: http://en.wikipedia.org/wiki/Rheinmetall_MG3). 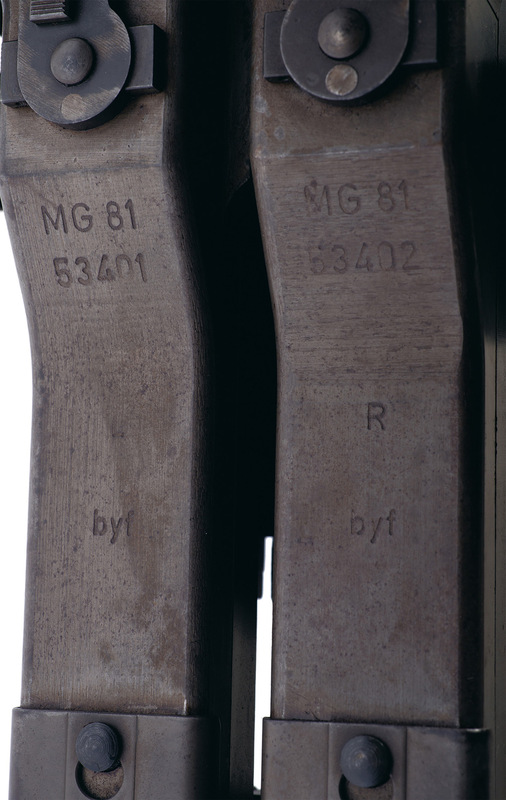 The MG 42/59s made for export by Rheinmetall are frequently fitted with heavier bolts to slow the rate of fire, but MG3s still have the full on linoleum ripper rate. Bam! Michael beats me to the punch! “Michael Schumacher” has got the MG numbering right. In ammunition designations, the LAST digit depends on function: x1 is HE, x2 is HEAT and HESH, x3 is AP. So a DM 13 is the first AP round of a caliber (DM = Deutsches Modell), DM 23 is the second AP round and so on. This is NOT done on calibers below 15.2 mm. So the 7.62×51 AP is actually DM 151 (15th model in 7.62 mm), not DM153. These are the rules. BUT we actually have 12.7 mm DM13, DM23 because some people were unaware of the rules set by their own organization. The sniper cartridges 7.62×67 (.300 Win Mag) were initially also wrongly designated DM21 (ball) and DM31 (AP) until someone recognized this was wrong, because these numbers existed already for 7.62 mm. They are now DM121 and DM131. I never really understood why people consider us systematic. A last note on subtleties: the MG 42 was “Maschinengewehr 42”. In the Bundeswehr the MG 3 is “Maschinengewehr MG 3” (not the letters MG between Maschinengewehr and the number). This applies to all Bundeswehr small arms, for example its not “Gewehr 3” but “Gewehr G 3”. So the HK121 when introduced to military will become MG4? I believe there is already one new LMG – has it been called MG5? exactly the other way round: the already fielded 5.56 machine gun is the MG4, the 7.62 machine gun which is scheduled to become the MG5 is the HK121. Thanks Michael and all the other readers for responding. As in every country so much more in such developed and well balanced society to judge and decide priorities must be big task.